A seller may finance a portion of the purchase price of relinquished property. However, if the seller receives the note, the note is taxable because it is not like kind property. An exchanger considering seller financing should consult with an accountant experienced in exchanges to determine the exact tax consequences. It is possible to provide seller financing for the relinquished property and keep the note non-taxable. To do this, the note must be retained by the intermediary. If it is transferred to the exchanger, the note will be taxable to the exchanger. The intermediary is required to dispose of the note during the 180 day exchange period. If the intermediary owns the note at the end of the exchange period, it must be transferred to the exchanger and will be taxable. There are three ways for an intermediary to dispose of the note and retain the non-tax status. ► The note can be transferred to the seller of the replacement property as part of the consideration for purchase of the replacement property. 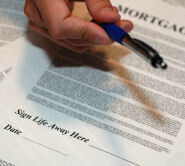 It is unlikely that a seller will agree to accept the note from the intermediary. If the note is transferred to the seller of the replacement property, installment sales treatment will not be available and the entire amount of the note is taxable when transferred. ► The note can be sold at a discount to a purchaser. This is usually not acceptable because of the steep discounts expected by discount purchasers. ► The note can be sold by the intermediary to the exchanger for cash. In this scenario the note is not taxable upon transfer. This procedure usually produces the best tax and economic consequences for the exchanger.